It was 2003 when I was last down in the Brindabella’s. Back then I was with the SES and we were supporting the RFS and the residents of Canberra who’d just been through hell as a bushfire rained down on them. A few of us back then said, we must come back here and have a look around. It took 5 years of planning but last weekend we finally made it down to the Brindabella’s for a weekend of 4WDriving and camping. A group of us from SES headed off to Cotter Dam on the Friday night. This would be a good starting point for an early getaway on the Saturday, besides our last experience of Cotter was of melted traffic lights, burnt buildings and charcoaled trees. Remarkably the landscape has come back pretty well; there are still scars on the earth of just how bad it was back in 2003. 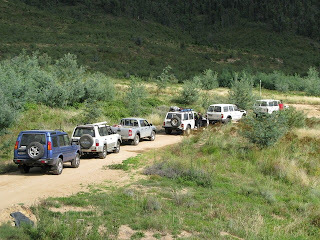 Saturday dawned and by 9.30am our full party of 4WD’s were assembled. An acquired track file was the bases of our route. We were quickly off the black top where we encountered numerous joggers and MTB’s, all out for a bit of exercise. The tracks, and there were plenty to choose from as this is a logging area, were hilly but all in good condition. We were up hills and down dales countless times. A punctured tyre had us stopping for our first view of the vista. Onwards we went; eventually we were driving into the town of Brindabella. 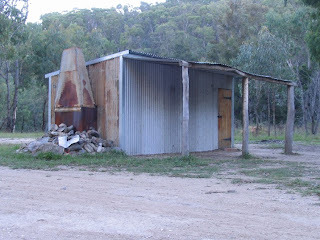 In 2003 this was a command post full of firies and smouldering trees. Today it was our stop for morning tea and quick dip in the river for the kids. Northwards we headed, into some rugged mountain ranges. The tracks were steep, the scenery breath-taking and everyone was having fun. We stopped down on the Goodradigbee River for a cache and some lunch. The river was flowing well, from recent rains and most of us had a relaxing swim. A few of us par-took in the nearby cache Vertigo. Onwards again, this time, up up and up we went. The track followed the ridge line, taking us to a height of approx’ 1300m. Eventually it was time to drop back down to the river. This time we were heading to our camp site at McIntyre’s Hut. I’d heard so much of this place that I just had to come and see it. Again on the banks of the Goodradigbee River we made camp for the night. With refreshments in hand it was time for another swim in the river. Some chose to do a bit of fishing, others floated down the rapids. All of us enjoying the peace of being out in the bush. As the sunset and with everyone refreshed, our bellies full of good food we sat around the campfire enjoying the banter and a few ales. Sunday started with a fresh breeze letting us know how cold this place can be. Packed up we were on the road again. We picked and chose our tracks carefully and eventually we were at the base of Mt Coree. A holed sidewall on one vehicle slowed us temporarily but we were quickly making our assault of the impressive pinnacle nearby. 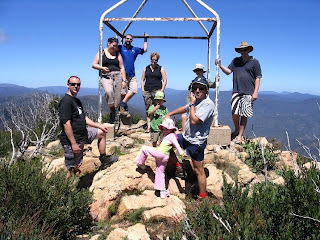 1421m later we were on top of Mt Coree. A 360 deg’ spectacular view greeted us. Canberra in one direction, Tumut in the other and rolling mountains all around. We had lunch atop here, you couldn’t have ask for a better backdrop. Eventually we had to head back down the hill and our weekend was slowly coming to an end. As we hit the black top for the first time in 130km we bid farewell to few of our party. The rest of us went on to grab a few more local caches before putting closure to the weekend. Thanks to the Cheekyfrogs, Odee McPodie, HK Rat, Big Matt & Shell and few muggles for making this an enjoyable weekend for the Rats.